So you guys know how much I love living in Boulder! But I gotta be honest…March is my least favorite time of year to live here haha. It’s still so cold here and I’m feeling so ready for spring! We recently went to Mexico and I loved getting to shop for spring and see some of the new spring trends! When I was shopping for our trip, I found a few new spring items I am LOVING that I think every girl needs in her spring and summer wardrobe! One of those items (y’all might recognize from my IG stories last week!) is these adorable belted taper pants. Y’all know me – I am totally a jeans and a t kind of girl. I live in denim shorts in the summer. But I LOVE that these pants change up the denim short rut and spice up any outfit! They are so versatile too! You could easily pair these with a nicer button down top and heels for the office. Or, wear them super casual like I did here with some slide sandals and a tank at the beach! 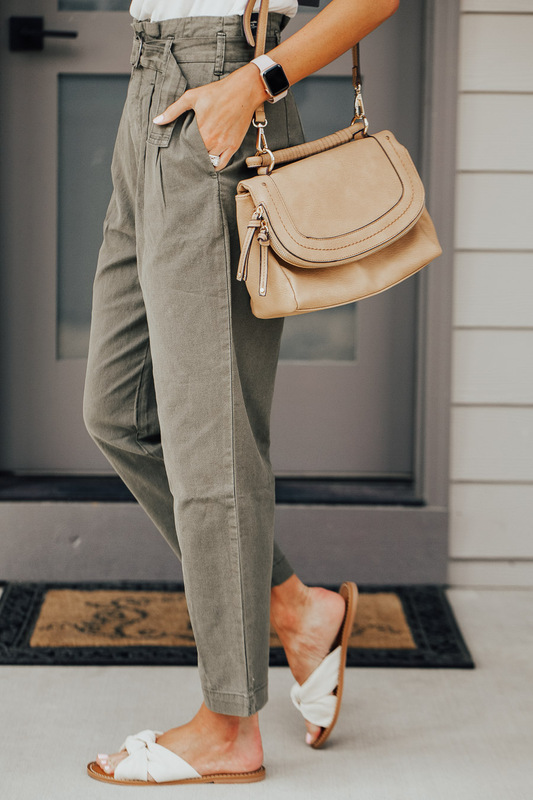 The ‘paper bag pant’ is a huge trend for spring and I am HERE for it. 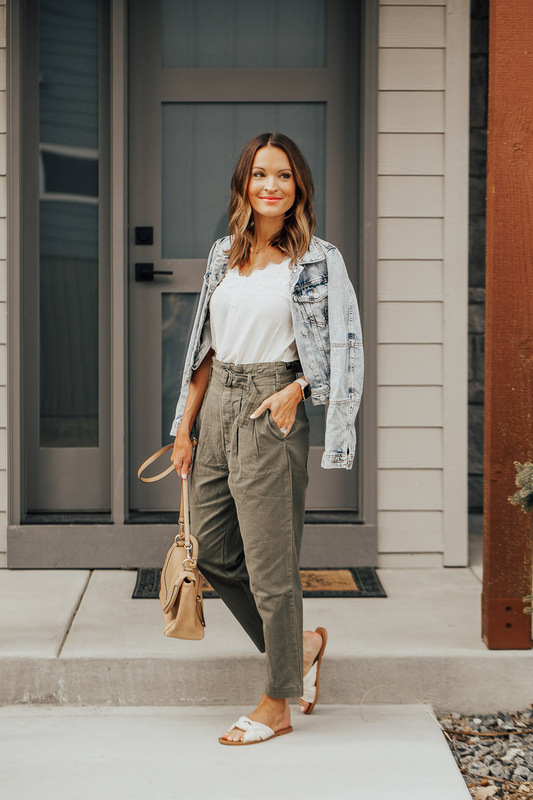 The high waist on these pants make them super flattering, and I love that they have a loose yet feminine fit to them! I’m wearing the small for reference! They are a tad big on me but I like a looser fit with this type of pant! I am also loving these adorable knotted slide sandals! Everyone needs a good sandal in her collection you can throw on with denim shorts, a swimsuit, or a sundress…and these sandals are exactly that! They are so comfortable and look adorable with any outfit! Once you buy them, I think you’ll easily find yourself throwing them on almost everyday of the week! That’s been the case for me for sure and I love it. I think a good layering cami is also so essential year round. If you’ve been following me for a while, you know I wear this lace trim cami ALL the time and have it in just about every color! In the fall I wear it under cardigans, and in spring and summer…it’s so cute under a denim jacket or on its own! You could also wear this to work underneath a blazer. I am wearing the size XS for reference! If you don’t yet have a denim jacket that you love, I can’t recommend buying one for your year round wardrobe enough! I wear my denim jacket with literally EVERYTHING – over sundresses, with white jeans, jumpsuits…you name it! This is one of the best investments you can make for your wardrobe. I’ve gotten legitimately hundreds of wears out of my denim jacket. 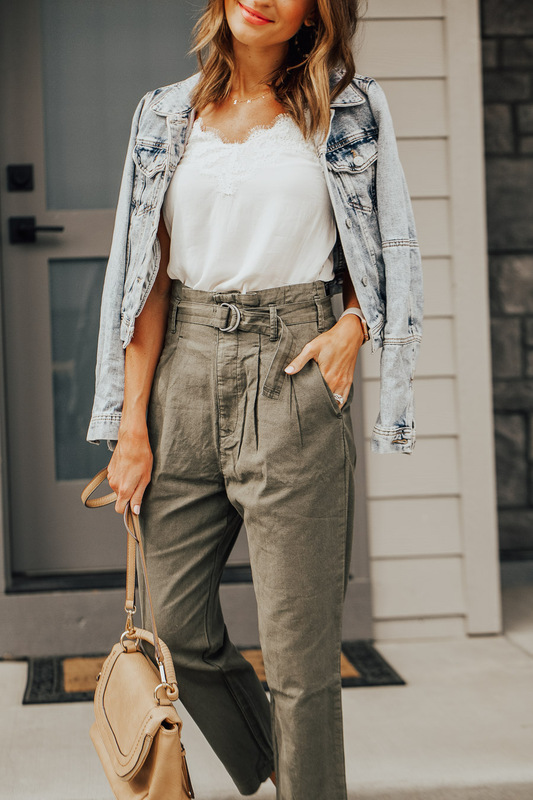 I love a denim jacket with these belted pants because it makes the look more casual, but put together at the same time! Hope this post helps you add some pieces to your spring wardrobe that make you feel inspired, beautiful, and ready for warmer temps! Thanks for reading! This post was created in collaboration with Abercrombie. As always, all thoughts and opinions are my own!